I knew I did a lot of ‘cultural’ things prior to starting this monthly blog post series, but I didn’t realize quite how many I did on a regular basis. As I sat down to write this post I realized I’d done so much that I could easily have posted a weekly Culture Corner since the last one. Instead you’re going to get a LOT of pictures (three distinct sets) with brief explanations of each. These first two photos are from a book talk that the local Friends of the Somerville Public Library held on June 17th. It was a fascinating talk about living a self-sustainable lifestyle and raised about $1000 for the FSPL. Rohan Anderson, an Australian, was in the US doing a tour and spoke about his book Whole Larder Love, which is also the title of his very successful blog. Overall it was a great talk and the vibe was fun and relaxed. I wish he would’ve spoken a bit more about urban foraging, but hearing about his story and the things he’s doing to make people more aware of their carbon footprint and their lack of healthy lifestyles was inspiring. This second set of photos is from the Museum of Science. A friend and I got museum passes from the public library to go check out the Dead Sea Scrolls exhibit. (You should check and see if your library does it, these would generally reduce cost of general admission from $22 to $7 and they have many passes to different museums.) I missed seeing the Dead Sea Scrolls when they were in North Carolina, but I made sure I saw them this time. 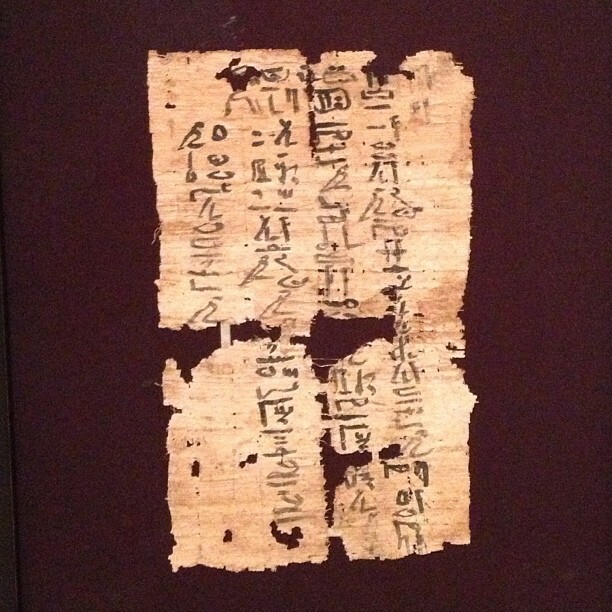 They were fascinating and, similar to this piece of Egyptian parchment in the MFA, the idea of someone handwriting these scrolls on vellum so many thousands of years ago gave me chills. I also really appreciated the scrolls being put into context by the MoS and I assume that this is the same exhibit that travels around the country/world. There were a few hokey parts of the exhibit like the entrance speech, but they were well done and I appreciated the value they added even if it made me want to shake my head. If there was one major detraction to the exhibit, and this has to do with the expected audience of the MoS, it was the actual display of the Dead Sea Scrolls. I’m not sure if you know this about me, but I’m roughly 6’3″ (1.9m) and the scrolls were displayed at about my knee level. So in order to read them and get a good look at them I had to double over at the waist or get on my knees. It was great for the kids they could just lean forward and look at them, but almost every adult in the room was doubled over and it was a pain after awhile. After the Dead Sea Scrolls we wondered around and played with the exhibits (you don’t really ‘look at them’, they’re almost all interactive) including a cool new Pixar test exhibit. But what might have even overshadowed everything was the lightning show, lower right picture. I mean they played the Emperor’s March from Star Wars with ELECTRICITY and had lightning in the building. TOO COOL! This final set of photos is from the MFA’s “Art in the Street: European Posters” exhibition which closes this coming weekend. I’d been putting off seeing it to go with a friend, but it never worked out so I finally had to go and I dragged another friend a long and it was worth the trip. It was an interesting exhibit in that it spanned roughly 70 years of poster art in Europe. It was really heavy on German and Dutch posters with a few French sprinkled in here and there. The three posters I took photos of above caught my attention for pretty obvious reasons. The largest is a poster for the Dutch National Book exhibition and this is a blog about books so duh, plus I love books 🙂 The other two caught my attention for their color especially the Deutschland poster, it was so vibrant and beautiful. I’m sure there were other cultural things I did this month. Pretty sure I attended a few music things and a street festival, but these are all the photos I took. I’ll check in next month with newer and more exciting things! Love that Germany poster! The Museum of Science sounds very cool. I love visiting museums when I’m travelling, but I sometimes neglect the ones we have here in town. I need to stop that, I think. You never think about it. I’ve been here long enough I’ve stopped exploring and that’s a bad thing. I’ve got to get back in the habit! I would LOVE the lightning show. I’m chuckling at the mental image of you on your knees, surrounded by kids, reading the Dead Sea Scrolls. Hee! Oh fun! It was actually a cool exhibit minus the height set up of it. They did a good job talking about the region and the time period of the scrolls.